My Wardrobe Count: What I own and how much it all cost | Save. Spend. Splurge. Do I like to shop? Yes! Do I have a lot of free time? I did, when I wrote this post! Will I keep up with this inventory list? Probably not. Let’s see how lazy I can become, shall we? Am I going to keep shopping even knowing all of this? Er… can I take the Fifth? I had been planning on doing a true inventory for a while now, but I wanted to wait until I purged everything before trying to list everything. I have owned about 30% of these pieces since high school/college years. Yes.. really. If it still fits, and looks to be in a good condition, I’m keeping it. It took me 2 hours, 2 full pages, 2 columns-wide, front and back to list almost, and I had to go into the columns a little bit (oops). This is also a great exercise to make sure I have pictures of everything — I noticed I was missing quite a few pieces. Hey it isn’t as bad as I thought! 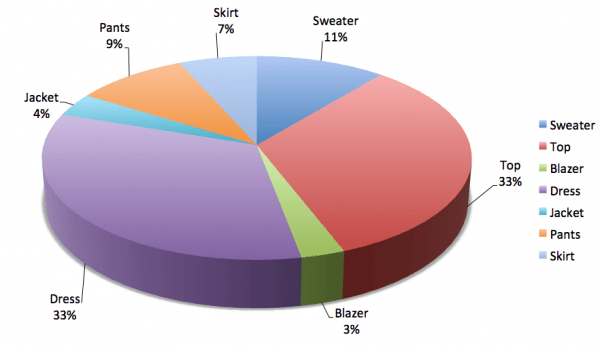 Granted, I had purged 50% of my closet sometime in 2007-2008. I also started selling more stuff in 2011-2012. Plus, I gave away at least 3-4 full bags of clothing and things. I guess I could cut it down to 100 clothing items, but that means cutting into my Dresses, which I am not really keen on. For some reason, I was imagining my clothes to be around the 250+ mark.. so this is a bit of a relief. What these 136-items cost: $10,219! So you want to know numbers? I had to guesstimate a few of these items, but my wardrobe comes up to around $10,219 before taxes, at retail. With the taxes (13%) on top of that, we’re looking at $11,547.47. Now if I were to SELL these items, I could probably get $5000 out of the resale value of what I own. You will also have to keep in mind this doesn’t include my shoes, purses or jewellery. What are in all the categories? 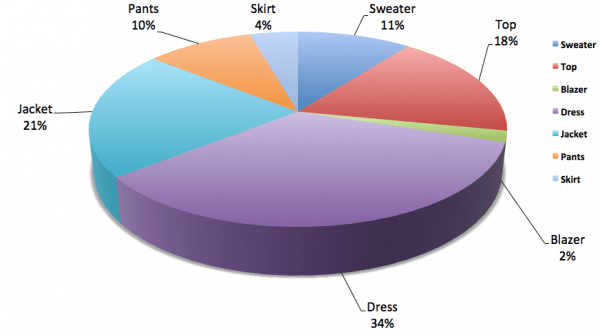 Spent 34% of my money on 33% of my wardrobe — Dresses!! I know this looks like a lot, but I am including everything in here. My biggest category is obviously Work-Appropriate Blouses, which I would like to say I also wear for fun. I rarely wear sweatpants, but some occasions like bumming around the house, call for them. The fun skirts are not miniskirts, but they are still in my eyes, too short to wear to work (few inches above the knee). What can I say? I’m REALLY into wearing dresses. It’s like a whole outfit in one go, how can you go wrong? The only thing I hate is that I can’t wear dresses as often in the winter (too damn cold, even when I double-up on tights), so a lot of my stuff is Summer-Appropriate. If I feel like it, I do wear more dressier dresses out just to get groceries. I find it fun to dress up, and unless the style is really inappropriate (too formal or shiny, cocktail, or flouncy), anything goes in my world. Love me a good sweater! They’re great as a way to layer on top of lighter things, or to wear as-is. What I consider “casual” versus “work” sweaters, are either the colour or the style — if it’s too sporty (Lululemon stuff), I don’t wear it to work. Otherwise, they’re pretty much all work-appropriate sweaters! I don’t have much in this department. I only have the basics to throw over top of my other more colourful items. One of the blazers is part of a grey tweed 3-piece suit, the rest are in navy or black. This includes Autumn and Winter jackets. I have 2 winter jackets — one everyday, one dressy (BF bought it for me). Note: The 2nd black Burberry trench from the left is almost the entire amount at $1600. I have 2 autumn jackets — one in a bold colour, the other is neutral. My last jacket is a black biker-style cotton jacket that didn’t fit under “Blazer” or “Sweater”. I am not entirely sure I want to really inventory underwear or sleepwear. For instance, I usually only have one pair of tights in each colour (navy, burgundy, black, brown). I will however, want to inventory the rest — winter gear, purses, shoes, and jewellery. How will this change my shopping in the future? Would you kill me if I said it wouldn’t really? Lately, I seem to be paying more, for fewer pieces. This goes in line with not wanting to buy quantity, but quality, although if I find a great shirt for $16 that isn’t a duplicate in my wardrobe, I’ll probably buy it. For instance, I bought a cashmere travel wrap for $300. ONE WRAP. It’s considered ONE sweater. In the past, I never spent more than $30 – $50 on a sweater. This is 6 sweaters in one pricetag… but far more heavenly. Cost per use, right? Hello? Anyone?… ANYONE WITH ME?!!?! Have you done something similar with your closet? 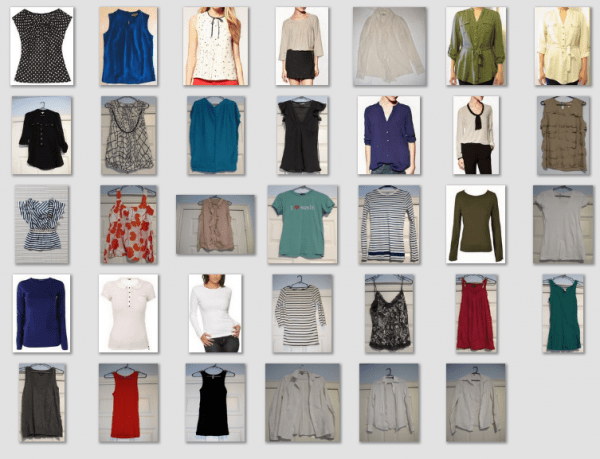 I know this post is outdated now but your idea of cataloging the wardrobe is appealing to me more and more. I’ve been working on getting rid of items in my wardrobe lately. I have enough to open my own boutique M, sometimes I feel like just renting a space one weekend, using my social media skills to publicize it and just being done with it once and for all. If I was in a city this would be a more viable option but on Maui, it probably wouldn’t be too effective. What has helped me let go of things I love but don’t use because it’s too small, not appropriate for my current lifestyle or I simply have too many in the same category is: (1) I’m more effective now at selling, not for a lot but enough to soothe the separation anxiety (2) Setting a limit quantity. #2 is where I think cataloging will help. For example, I had 5 leather jackets. FIVE and I live on Maui. I used to have six but that’s a story for another day. I loved them all, very cute, all different in terms of color and style and weight. Once I decided I would keep two (a grey lightweight 3/4 sleeve crop in a retro style, can wear in an AC office easily & one other good for Fall/Winter travel), it was easier to let the other three go. I tried them all on and right away decided to sell two because they were size 0/2, XS. Although I could get to be that small again, it seemed to make more sense to keep say a M or size 6 that I could fit into at a variety of weight ranges rather than keeping the tiniest sizes. It was also more likely I could fit a wider variety of clothes underneath like a sweater in the middle sizes. 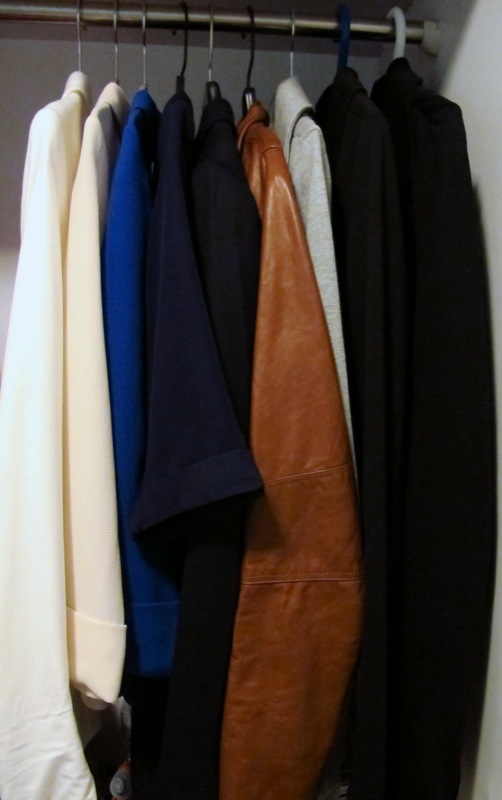 Picking the last jacket to sell was a little harder, it was between an expresso with brass hardware and a black bomber like with industrial zippers on the hood and sleeves. Both are hoodies. I went with the black by thinking about where I would wear this jacket. The answer would be travel to the Bay area or East Coast and I typically bring a lot of black items when I travel. While the expresso is so cute with a white top, beatup jeans and brass jewelry, the black is probably the one I would grab if trying to travel light with my usual black/grey theme.The black is also a size 8 while the brown is a size 6 so I could always make it work at my current size or as I lose weight. It’s also warmer. Now, I wouldn’t have gone through this thought process at all had I not set limits for myself. I would’ve just thought they’re cute, all different colors and that’s it. So, I think once I get things down to a manageable level, I’m definitely looking for an app to catalog. I think it’s a great idea to look at our “inventory” before ever pushing the buy trigger. I haven’t sold the expresso yet, I did list it on the higher side because I wouldn’t feel good about it otherwise so we’ll see. Oh goodness. Well.. I guess if you live in Maui you don’t need leather coats at all, but I find it painful to part with clothing I love only because I know how long it took for me to find it, love it and then choose it specifically for my wardrobe. You know? I guess that’s my problem. Sentimentality in light of the time it took to hunt it down, although I am getting a lot better these days in not buying anything at all. I still only have those two scarves from Paris, and about 700 EUR left in my pocket I don’t think I’ll end up spending. Love the belted blazer. Is there much structure to that? Where did you find it? Oh wait did you mean the dark blue blazer? I got it from Dynamite!! And no there isn’t structure to it. I like my blazers comfortable and loose. Not tight and restrictive. I definitely want to do it and should do it, but I recognize it’s a daunting project so I’m going to have to do it bit by bit. I think the best slow approach is to take pics of my outfits each day as I wear them. Will help me inventory. I thought about that too.. but then I realized I’d get lazy if I didn’t do it all at once! I’m doing it too, so I am aware of the work it takes to buy the item and then to photograph it!! I’ve gone through my tacky clothes phase from high school. I remember my huge high heeled black shoes that were like rubber blocks that I thought were the bomb!! I’m slowly but surely working on it. I have a number of dirt cheap items, and quite a few high dollar items. I find I tend to get more wear out of the high dollar items, because they have to be absolutely perfect before I’ll take the plunge on them. It makes them easier to just throw on and go without thinking too much about it. While I can’t see myself ever owning 45 dresses, I understand the idea of owning more articles of what you actually wear vs ones you don’t (jeans). I’m definitely with you on the cost per wear. I have a pair of jeans I bought 5 years ago for ~$250. I’ve worn them to death. They get worn at minimum once a week, which puts them currently under $1 per wear. I wish I had bought more of them. Well to be honest even I think 45 dresses is bananas!! 🙂 I need to pare down but I can’t seem to get rid of anything. OMG. I thought I am the only wierd one when I did similar thing (minus photos ofcourse) for all my possesions. I estimated that I own around 6000 $ worth of stuff. This doesn’t include my lappy and basic essential clothes (like socks etc). I also guestimated value of items which were gifted to me. Now everytime i buy something or get rid of something this list is updated. I just went through my closet and ruthlessly purged. I am participating in Project 333 (sort of) and got myself down to 33 items (clothes and shoes) to wear for the next three months. These items don’t include sleepwear, workout apparel or lounge wear. If it did, I’d be way up and over the 33. But, if I counted my winter/fall wear in there, I’d probably be hovering around 100. If not more. (They are also in sizes ranging from 4 to 10, what can I say?) You have a lovely wardrobe and you can afford it. The problem comes in when a person spends money they don’t have on things they don’t need. If you wear all of those clothes, then have at it. Once I finish purging my house of all of the excess crap and focus on what I need, I’ll tell you that as I replace items in my wardrobe that no longer it, are damaged, etc. I’m going for quality over quantity. Now, I haven’t added up how much I spent on those clothes like you did. Maybe one day I will. I still feel enormously guilty 🙂 even more so when I move ALL that stuff and I don’t wear it all.